NAMM 2011 PRESS RELEASE: A pioneering collaboration between mp3 creator, Germany-based Fraunhofer IIS, and innovative plug-in designer/manufacturer Sonnox Ltd., has resulted in a groundbreaking plug-in set to revolutionize the way audio is mastered for online distribution. In an industry first, the Pro-Codec plug-in enables mix and mastering engineers to audition up to five codecs in real time within a DAW environment, produce an optimized mix and batch encode to multiple formats simultaneously. All major codecs, including mp3, mp3 Surround, AAC-LC and HE-AAC are supported, as are lossless codecs such as mp3 HD and HD-AAC. Recognized for their exceptional sound quality and innovative graphic displays, Sonnox has developed an intuitive FFT display to illustrate the input signal, output difference signal and a unique graphical indication of the audibility of codec-induced noise. Bit-stream integrity meters reveal potential decode overloads. Instant A-B auditioning enables engineers to glitchlessly switch between codecs. A 'blind listening mode' (ABX) augments codec comparisons. The Pro-Codec plug-in is compatible with all popular DAWs - Pro Tools, Logic, Cubase, Nuendo, Sonar, Sequoia and Wavelab. Both Mac and Windows are supported. 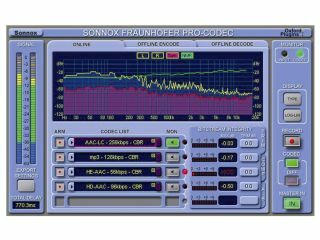 The Sonnox Fraunhofer Pro-Codec plug-in will be introduced at The NAMM Show in Anaheim California, Sonnox Booth # 6278, and will be available shortly thereafter at a price of $499.